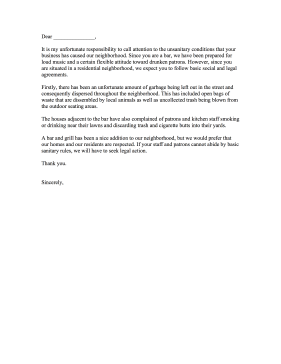 Neighborhood residents who are the victims of industrial pollution can use this letter to request that businesses change their unsanitary conditions. It is my unfortunate responsibility to call attention to the unsanitary conditions that your business has caused our neighborhood. Since you are a bar, we have been prepared for loud music and a certain flexible attitude toward drunken patrons. However, since you are situated in a residential neighborhood, we expect you to follow basic social and legal agreements. Firstly, there has been an unfortunate amount of garbage being left out in the street and consequently dispersed throughout the neighborhood. This has included open bags of waste that are dissembled by local animals as well as uncollected trash being blown from the outdoor seating areas. The houses adjacent to the bar have also complained of patrons and kitchen staff smoking or drinking near their lawns and discarding trash and cigarette butts into their yards. A bar and grill has been a nice addition to our neighborhood, but we would prefer that our homes and our residents are respected. If your staff and patrons cannot abide by basic sanitary rules, we will have to seek legal action.